When ClojureScript was first announced there was much gnashing of teeth over the fact that it provided neither eval, nor runtime macros. 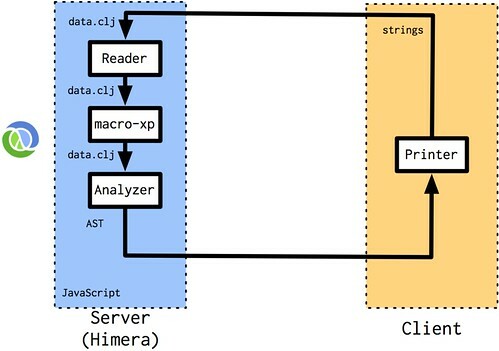 In response, I did tackle the matter of eval, but code speaks louder than words, so I therefore present Himera, a ClojureScript compilation web-service. I have a deployment of Himera on Heroku (shown below — caveat emptor) if you’d like to play with it. Additionally, the Himera source code is available on Github. Himera1 (Russian: Химера, pronounced Hee-mera with a trill) is an experiment in slicing and dicing the typical REPL model of Lisp computation, providing a modularized web service for ClojureScript compilation. 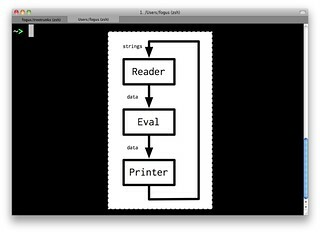 That is, a REPL is a composition of three repeating functions: read, eval, and print. 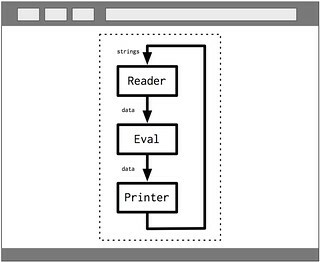 The read step takes a string (or maybe an input buffer) and produces a Lisp data structure representing the program in hand2. 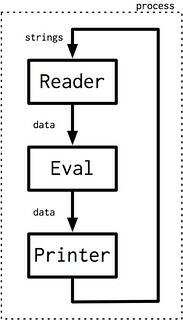 This data structure is then fed into the eval function and executed as a program. Finally, the result of the evaluation step (another Lisp data structure) is printed to the user. It simply does not need to be configured in such a way. The very nature of Lisp and its furcated architecture allows many different ways to arrange the components of a REPL. Some input device reads a string of characters and feeds it into the reader as a true string datatype or some input buffer. "(vector :thx (-> 1138 - str))"
The result of the Reader is always a Clojure data structure, Java instance, or an error. This is where Clojure’s idea of (and Lisp in general) code as data diverges from the syntactic representation. The analysis phase of ClojureScript compilation builds an abstract syntax tree (AST) that represents the program itself, divorced from syntactic matters. That is, the tree structure defines logical groupings along branches, binding contexts alongs tree depth, etc. This is where Clojure’s (and Lisp in general) code as data diverges from its parse form. The analysis phase also marks the end of the the first phase in ClojureScript’s 2-phase compilation process. 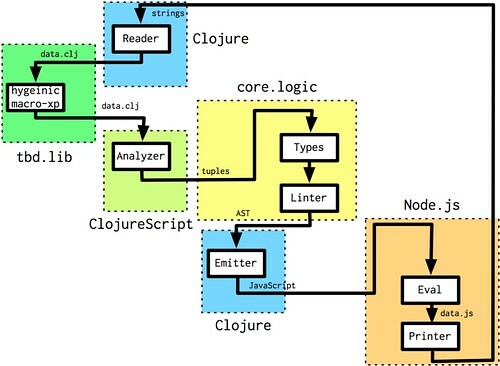 Taking this exploded view of the ClojureScript compiler to heart, imagine how the traditional REPL model might look differently under various operational constraints. Below I will illustrate a few. 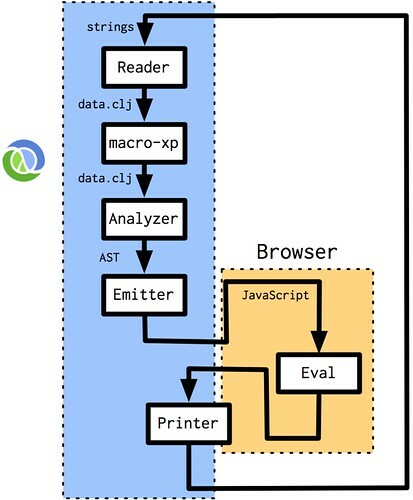 That is, the read, compilation, and emission steps all live in Clojure and the evaluation phase lives in the browser. As you may have noticed, the print phase exists a bit in both, but the details of that are not important for the purposes of this post. This scenario turns out to be extremely powerful for a number of reasons, the most obvious being that it’s nice to evaluate live code against the environment in which a large percentage of the production code is likely to execute. 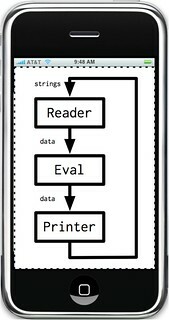 Further, connecting to the browser in such a way allows one to build up a browser-based app live and experiment in realtime with different code paths. It’s this very scenario that makes the M.O. of ClojureScript One so compelling. For the future it would be spectacular to see the browser-connected REPL target multiple browsers at once, vetting returned results via quorum. Smarter people than me are thinking through just such a scenario problem as you read this. Can you imagine if that was your development environment? We’ve only scratched the surface. Compiler as service is the new black. You could then interpose other AST processing services along to way to modify and/or annotate the AST with additional processing. Ambrose Bonnaire-Sergeant is exploring a typed Clojure variant using this very technique. This slicing and dicing of the Clojure compiler is probably not new. I suspect that these techniques have been known and used at various times in the history of the language — the core Lisp philosophy begs for it. The modularized compiler is extremely flexible allowing interposition, enhancement and replacement at any junction along the path from string to evaluation/execution result. 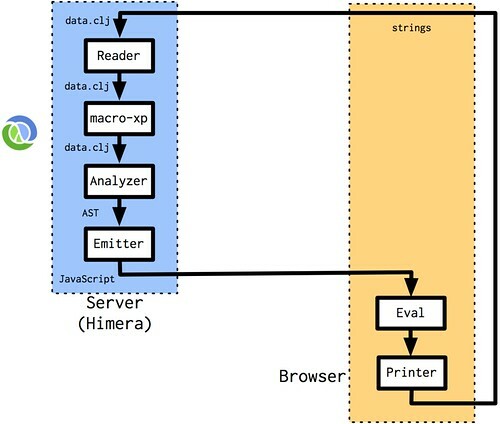 Himera is an exploration of this model of programming providing compilation as web service, but it’s certainly not limited this this model only. 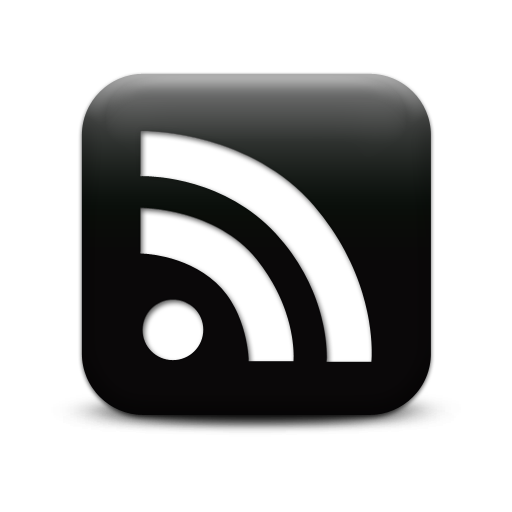 thanks to Craig Andera and Chris Redinger for moral support, content suggestions and reviewing a draft of this post. a special thanks to Jen Myers for her amazing design of the Himera REPL page. 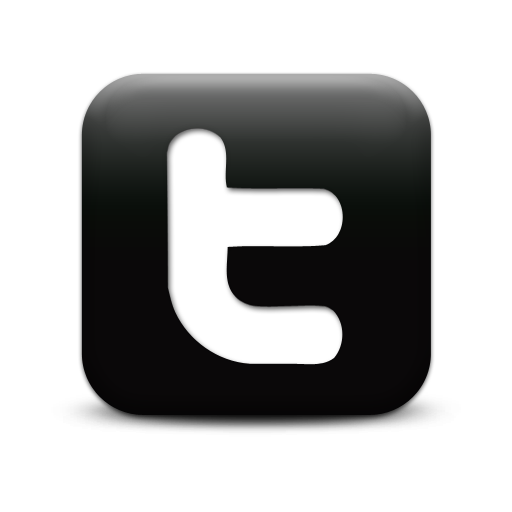 once you’ve worked with great designers there is no going back to the dark ages of programmer-styled apps.